The two biggest barriers for women not maintaining a healthy lifestyle is ‘lack of time’ and ‘health not being a priority’. Women’s Health Week is the time to do something for your health and start making positive changes that can last a lifetime. During the week, we encourage individuals, communities and workplaces to get involved by sharing our health messages, hosting an event and encouraging as many women as possible to sign up to the week. By signing up to the week, you'll receive daily health tips, tools and information to help you unlock your own powers for good health. Jean Hailes for Women's Health ran the very first national Women’s Health Week in 2013. Last year, more than 85,000 women participated in more than 2,100 events. We are proud that this event attracts the support of organisations, ambassadors, businesses, community, sporting and media groups across the country. Now in its 7th year, Women's Health Week is the time to unlock your own powers for good health. 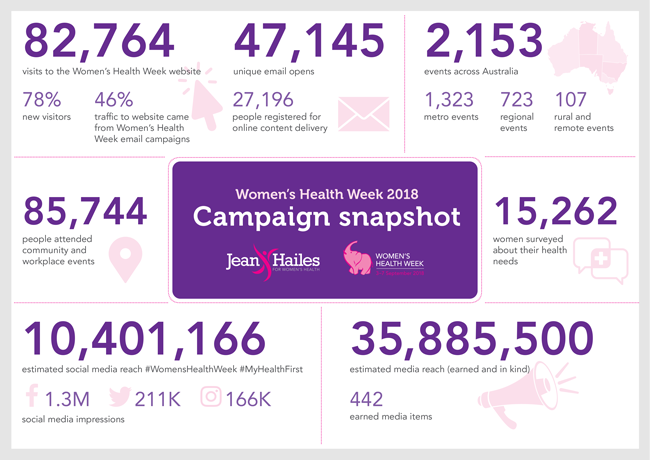 Jean Hailes provides health information and free resources to support women across Australia, and during the week we encourage communities and workplaces to get involved by sharing our health messages, hosting or attending a health event and signing up to receive five days of informative health content. Jean Hailes for Women’s Health is Australia's leading and most trusted women's health organisation. We are a national not-for-profit organisation dedicated to improving women’s health. We provide women with health information, resources and clinical care to assist them to actively manage their own health and wellbeing. We believe in physical and emotional health and wellbeing in all its dimensions for all women in Australia throughout their lives.